Focus divider screens link together to define spaces within a working environment. 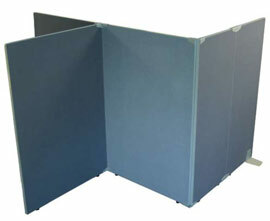 The screens are manufactured from pinnable fabric covered mateial, finished with a durable powdercoated aluminium frame. Precisions unique screen connection system allow for quick and easy installation or relocation of the screen system. Standard screens are 1200mm, 1500mm and 1800mm high.